William Jacob (Bill Jake) Keller Jr. was the last private owner of the HKMI property. 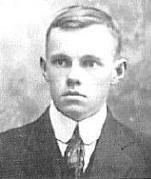 He was a direct descendant of George and Barbara (Hottel) Keller and inherited the land from his father. He never married or had any children. 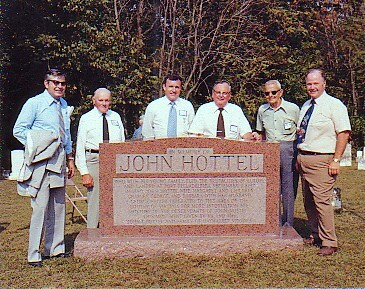 In 1982 he established Hottel-Keller Memorial, Inc.
Toward the end of his life he came up with ideas on various uses for the 392 acre farm and ways to market those ideas to the general public. He would stop what he was doing anytime, day or night, to write down his ideas while they were fresh in his mind. He would use whatever kind of paper that was convenient to jot down the notes, including green bean and stewed tomato can labels! While cleaning up the big room in the Mill building, the red building across the driveway from the Loom house, Virginia Shrum and Gae Ward discovered Bill Jake's scribblings. Gae transcribed the notes onto paper, which created a five page list of his thoughts and ideas for the future use of the property! While some of the ideas were a little eccentric or grandiose, at the core of it was the idea that he had something of historical and cultural value that was worth preserving and sharing with the public. Tanyard Restoration—Use plastic tube to pipe water to the basement of the utility building, then run it through the trough in the cellar of the house? Will it be objectionable? How about restoring the 2 still kettle fireboxes? Why is the chimney built with the square hole through it? Build a 2-piece front door. Tell John T. about these things……On the backside from basement to attic, there is indication of an elevator opening…..what does this mean? 5) Develop drives or a tour of all the points of interest on my acreage, including looking at various field crops and livestock. 12-21-78, 8:40pm --- HKMI Memorial: one type--- find a large monolithic piece of Mountain stone, say about 3’ thick x 5’ wide at the base x 20 or so feet tall. This stone might be an oversized imitation of the sandstone Paul Rhinehart has in his lawn. The big end should be planted in a stone masonry structure with a marble or granite tablet in each side. The front tablet facing Rt. 653, to be in the memory of Johannes Hottel, the left tablet in memory of Charles Hottel, the right tablet in memory of George Hottel, and the rear tablet to be in the memory of Barbara Anna Hottel Keller. Flowers, 1984: Activate cannabed – develop wild flower bed west of distillery location, Begonias on each side of water wheel, a gladiolas project. 11-1-82, 8:10pm --- Ideas for H-K Memorial Corp.: Develop Memorial Park at graveyard --- Do something about John Hottel house --- Develop reunion grounds out front. 11-24-79, 3:20am --- On restoring the road to the woods --- Do a permanent job on the road construction, see that the old section is wide enough for dual-wheeled trucks --- provide some more walnut trees for aesthetic and profit reasons. Consider wine grape vineyard, lake, gardens, log cabin, picnic tables and benches --- at or near the cabin have a privy with the pit lined with damaged (cheap) blocks. 11-11-79, 10:30pm --- My prospective Keller Hall: 42’x48’x16’/ 64’ , plus shop extensions of 48’=112’ . 8 bedrooms on top floor, 2 bedrooms, living room, kitchen, and dining hall on main floor. The heating system will be 4 charcoal ovens, the air being handled by squirrel-caged blowers. There will be an 8’ wide fireplace in the south end of the hall. There will be an elevator on the left side of the fireplace to serve the upstairs hallway and a handsome stairway in the north corner of the living room will also lead to the upstairs. Under this stairway, is the stairway to the basement. The 16’ x 42’ area in the NE part of the basement is for special uses. Then comes 3 bays: 14’,12’,16’ wide x 54’ deep for cars. Upstairs, outside, on the back, will be a concrete slab 18’ wide x 56’ with stairways down to the restrooms & dressing rooms for the ones using the pool. There will be a 10’ tiled border around the said pool. Going over to the south end where some shop facilities are, there will be a 14’ square doorway in the center by the back wall, leading into a 48’ x 72’ Quonset-style storage for antique machines. [undated] --- If I can get the log barn? Erect it on site of original barn--- put in tile floor, put in kitchen, and dining room , put in the old soda fountain. Have plenty of chairs and a projector. 6-12-82, 3:00am --- An idea about the John Huddle House: tear it down and re-erect it on the Keller Homestead. Use it for a museum. Downstairs, display fireplace cooking equipment. Install the Rhodes safe with or containing the Friedens Church Record, the Fairfax Land Grants, the reproductions of all the deeds and wills, and the silver and gold coins, spinning wheels, etc. Main floor: “Snitz” Hottel’s weaving loom, an old bedstead with ancient covers, table and chairs, and the loft with sleeping equipment. 12-19-76, 7:30pm --- Mrs. Wise & son were here after lunch. She is an interesting lady. Gave me permission to come and take pictures of the remains of John Hottel’s old stone home. Mrs. Wise wondered if there had ever been a road along the hilltop back of her place. I didn’t know. 7-5-76, 7:00am --- Idea: The little house on the Keller homestead: restore it to its original design for weaving and install the Keller loom therein. Have someone operate the loom producing fine material to market at a profitable figure. Have an admission fee to further commercialize the project. 7-7-83, 3:30am --- Provide a permanent depository for donated museum items. Appoint someone to be a committee of one on Road improvement. Hillside Memorial Park: whereas contractors want $5,000 to make it presentable, I think I can finagle it for very much less --- it will be a continuing project for quite sometime (don’t lose sight of a handsome native stone masonry 5-sided monument, each side to carry a tablet with the name of one of John Hottel’s children thereon). [not dated] --- HKMI has expensive projects to promote, for example: 1) update the History, 2) Acquire or get John Huddle’s house preserved, 3) Develop the hillside lot into a Memorial Park, 4) Development of the 43 acre George Hottel Homestead, 5) Preserve the Charles Hottel graveyard, 6) Construct a Museum building and a vault to protect family antiques.